For this week’s cool tool, I’m switching to sculpting. First up, I am very much an amateur in terms of sculpting with most of my green stuff work limited to filling in gaps and details to bits bashed models. The biggest issue I had with using green stuff was that it stuck to everything but the actual model. I tried wetting my tools, using vasoline, even used super glue to fix the GS to the plastic, but nothing was nearly as helpful as when I found silicon shapers. These fantastic little tools are basically paint brushes with a silicon heads in various shapes. For anyone who has used silicon baking dishes, you know how fantastic of a material it is for non-stick properties. I use them in conjunction with the normal metal sculpting tools to push the green stuff into rough form. Since they don’t stick at all to the green stuff they are great at shoving the clay into crevices that I normally struggled with in the past. The different shapes also come in handy for creating softer textures than the metal tools would easily provide such as using the chisel silicon shaper for the folds in cloth and the pointed version for pock marks. 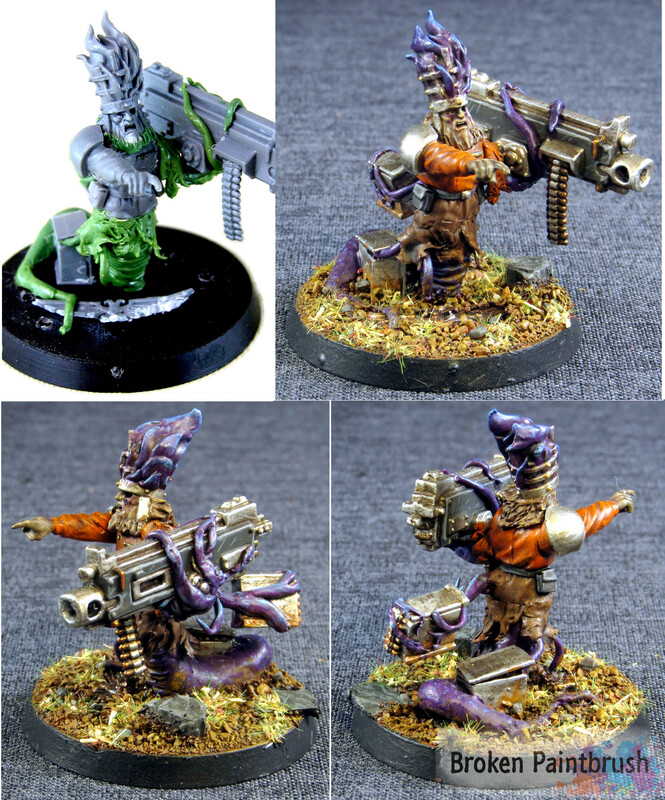 The most intense project I used it on was my custom Obliterator a few years back that was about 90% green/grey stuff. At that time I only had a single, large shaper that I picked up on a whim but it was super helpful for shaping the feet and pressing the folds into the body. Later on I picked up a couple of smaller silicon shapers that I used for my Traitor Guard Veteran squad. While not nearly as much green stuff work, the details needed to be much softer such as the snake-like tail of the heavy bolter mutant. If you do any sculpting work, even if it is just to add a few small detail, I recommend picking up a set of silicon shapers. Amazon has a set of the firm shapers for $25 which is a great size for detail work and make sure you get a firm or extra firm as the softer ones wouldn’t hold up to the stiff green stuff.